In our fast, daily business, we keep focusing on the next win. When we only look at the results and never scrutinize the means that got us there, we are likely to trade short term gains for long term losses. Values carry the business for that long term. 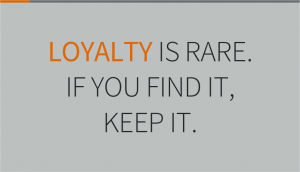 Loyalty is very important to me, because, when well-balanced between the partner and the manufacturer, it creates long term success. It should never be a one-way obligation. Both parties have to provide and receive loyalty. It requires an empathetic approach with a mindset to consistently create win-win situations. This is hard work and the same as in TRUST – words are cheap and deeds are dear. Actions define our relationship. Every day, the manufacturer must strive to provide the most relevant and competitive portfolio to the partner. At the same time, the partner should have a portfolio that is consistent with this partnership and not have a wide variety of competing solutions in the offering. Enduring relationships are formed in times of tough choices. IHSE stands by their partners as we grow our business and enter new applications and markets. We are doing our best to share knowledge, train and cooperate with our channel partners to offer more value for our joint end customers. In return, our partners are fighting in a competitive market for IHSE solutions. Many of our partners have been working with us for years and we will continue to do our best to keep their loyalty as we are expecting them to return it. You want to work with us to shape the future? Lets talk.